In this post we will study properties of rational approximations for modified Bessel function of the first kind commonly used to compute the function values in double precision for real arguments. 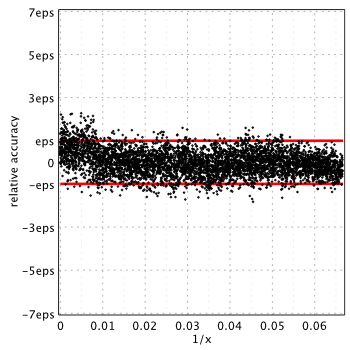 We compare the actual accuracy of each method, discuss ways for improvement and propose new approximation which delivers the lowest relative error. Boost and SPECFUN use modifications of original pair of polynomials provided in Tables 19 & 51 of the Blair & Edwards report. 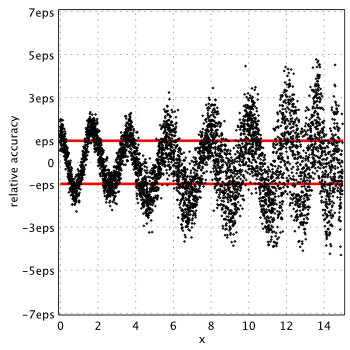 Numerical Recipes relies on different approximation of lower degree, but claim it to be suitable for double precision. 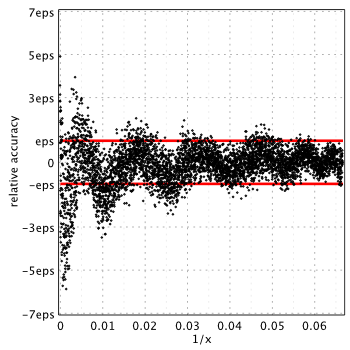 All of the approximations are capable of providing relative error down to 10-23 when computed using extended precision without rounding and cancellation effects. However, in practical situation, when approximations are evaluated in double precision, such level of accuracy cannot be reached. In general, when we deal with limited precision floating-point arithmetic – there is no point to push theoretical accuracy of approximation beyond precision we have on hands. Instead, conditioning of the approximation play the most important role here (its robustness to cancellation and rounding errors). Below we present actual accuracy of each approximation in terms of machine epsilon, eps = 2-52 ˜ 2.22e-16. All approximations are evaluated by the same C++ code for Horner scheme (without FMA) and compiled by Intel Compiler with /fp:strict switch to avoid compiler’s speculative optimizations for floating-point operations. 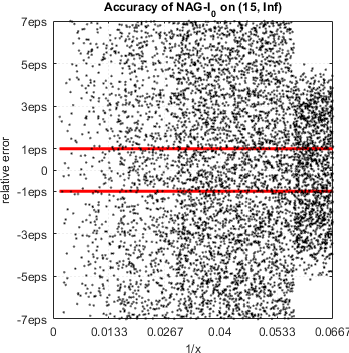 Relative accuracy is computed against true values of evaluated in quadruple precision by Maple. 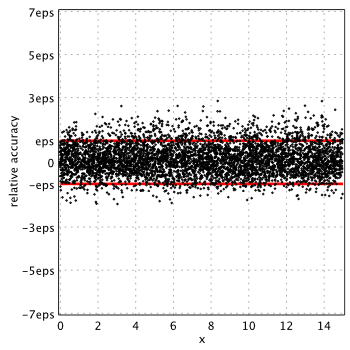 Red lines on the plots show limits of approximation error we naturally expect from double precision computations. Commonly used rational approximations are not able to provide relative accuracy close to machine epsilon. 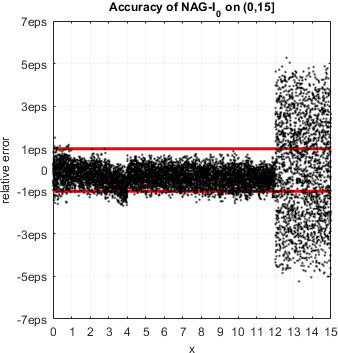 Even the GNU GSL and MATLAB which are based on Chebyshev series expansions and potentially more accurate, still cannot reach target level of accuracy (most probably last digits of Chebyshev coefficients are not correctly rounded in their implementations). 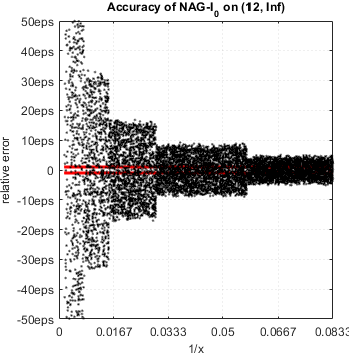 We run rigorous search to find optimal approximations among all polynomials and split point . 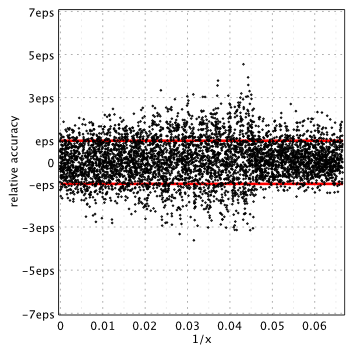 The search criteria includes not only the optimal theoretical approximation order but also minimization of relative accuracy in double precision. In other words, we take into account conditioning of the resulting polynomials in double precision. The split point is chosen so that sum of the errors is minimal among other possible solutions. The peak relative error on is 2.38eps, and 0.72eps on . Interestingly that optimal approximations are pure polynomials. We believe the reason is that power series of (which can be considered as polynomial) converges very fast and in general delivers good accuracy with small number of terms. Minimax approximations just try to fit the series and naturally denominator becomes . Same happens for large arguments, where asymptotic series gives high accuracy quickly and our approximation just tend to reproduce its coefficients. 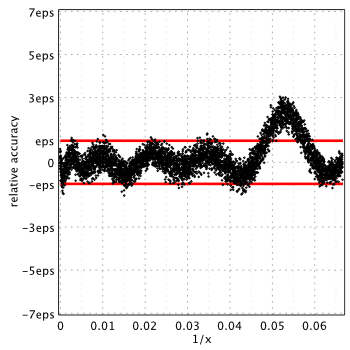 Overall, minimax approximations (3), (4) can be considered as “accelerated” power and asymptotic series of tailored for double precision computations. The split point is . The peak relative error on is 4.6qeps, and 3qeps on . Machine epsilon for quadruple precision qeps = 2-112 ˜ 1.93e-34. 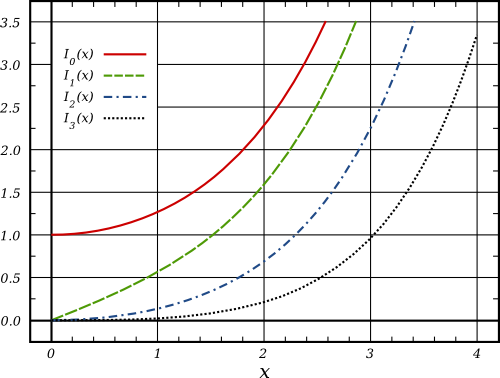 Proposed polynomial approximations for in the form of (2) deliver the lowest relative error compared to all commonly used approximations in mainstream software libraries: Blair & Edwards, Numerical Recipes, SPECFUN 2.5, Boost 1.59.0 and even GNU GSL which is frequently used as a measure stick to assess accuracy of other libraries. Cody W.J., Algorithm 715: SPECFUN – A Portable FORTRAN Package of Special Function Routines and Test Drivers, ACM Transactions on Mathematical Software, Volume 19, Number 1, March 1993, pages 22-32. 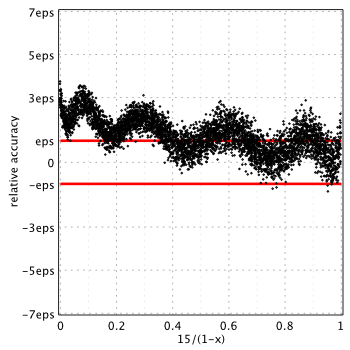 SPECFUN: Modified Bessel function of the first kind. * Evaluating your (4) as given may result in spurious overflow – which is to say the exponent term overflows before the result does – it’s easily avoided by multiplying by exp(x/2) twice in succession. But as this adds a little complexity it makes it worth while to split the interval over which (4) is used. 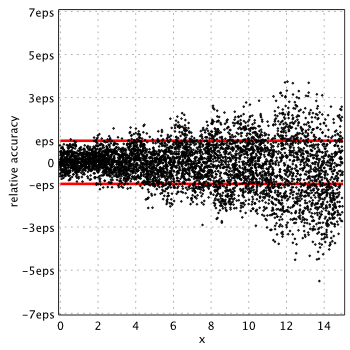 * I only needed 14 terms over [0, 7.75] to achieve double precision (max error found 2.1eps). * Your approximations extend to 80 and 128-bit real’s fairly easily by dividing up the region of (4) into several sections, I needed to use (3) over [7.75, 15] though as I couldn’t get much past double precision from (4) there: it seems to become ill-conditioned if there are too many terms in that region. As a result the max error creeps up to 4eps over the middle range, which is a shame, but it is what it is for now. * Reducing precision to float, results in a very compact implementation with 9 and 6 terms respectively for (3) and (4): something CUDA users may appreciate. The actual coefficients used will appear in the boost git repro shortly. Thank you very much for your observations and for using the approximations in Boost! 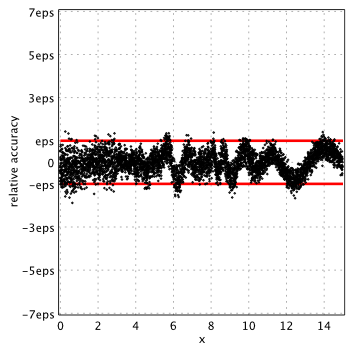 I have just added approximations for quadruple precision (128 bit) to the post. Polynomials become long but this combination delivers 4.6qeps and 3qeps peak relative error (estimated using 1M random arguments on each interval). This is overall minimum among all possible polynomials of < 50 degree. I confirm that middle range is quite problematic to build approximation for. Two-interval splitting seems to be the best. 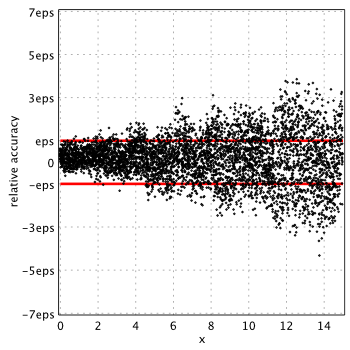 Chebyshev expansions might be more efficient for higher levels of precision. The code I used to derive coefficient generates both Chebyshev and Polynomial forms and tests both (since the two forms are inter-convertible), in general the Chebyshev forms are no more, and sometimes less accurate. I also went for more intervals and hence lower order polynomials – it seems to me that the extra comparisons are more than made up for by many fewer multiplications. Error rates were in line with yours.